The last time I wrote about the very popular game World of Warcraft or WOW, I discovered some of my friends and readers are fans of this massive multiplayer online role-playing game. So while enjoying the cool breeze this rainy Sunday morning, I thought I'd write a little more on this game. I'm not sleepy yet so perhaps another post here before I turn in? 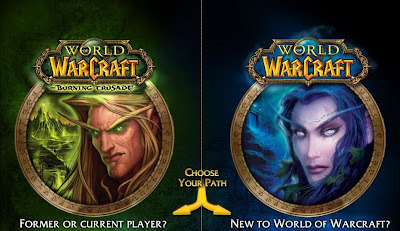 Brought to you by Blizzard Entertainment, World of Warcraft was first announced in 2001, following the successful conclusion of the previous Warcraft III: The Frozen Throne. The game was finally released in 2004 and since then, it has evolved into one of the most addictive online games with more than 11.5 million monthly subscribers worldwide. The success eventually led to Blizzard Entertainment announcing the publication of the first ever official magazine on this worldwide popular game. After my little research on this game, I was much intrigued by this immensely popular game. And when I chanced upon The Game Supply, I knew I had to share it with WOW fans who drop by my blog, especially those of you keen to Buy World of Warcraft accounts. The Game Supply provides the best platform for active gamers and fans to Sell WoW and Aion accounts to the Company, or Buy Wow and Aion Accounts from them. All prices are negotiable and live representatives are on call to help facilitate your transactions online. As a family owned company, The Game Supply runs a close-knit working operation; ensuring customers with a positive experience by keeping close involvement within the gaming communities. Customers visit and leave much satisfied with the high level of support and interaction. Having been around for 6 years, the company has been active in the sales and reselling of massive multiplayer online role-playing game and plans to stick around for many years to come. So if you're a fan of WOW and would like the best recommendation on where to buy or sell WOW accounts, look no further than The Game Supply. All your WOW gaming and purchasing or selling needs are right here! Wei coming to 1030 edi, hahahah! Wat time zzzz?!! hahah i oso don know wat time zzzz aiyoo!! Cool! But I'm not into online gaming anymore,stopped playing online and network games 5 years ago. Crazy la me still watching OTH!! Early bird gets the chop Mon! Wah so fast season 3 edi! im at season 2 for OTH now…getting interesting…. Ohhhhh then try this one la Tekkaus! It looks interesting albeit a little complicated for me. Perhaps I’ll bug B to play it so I can see how to play he he he! Thanks for buzz dearie but i was asleep edit.. hehe.. never played this game before .. takut addicted. lol! Maybe I should Ayie…do u know how to play this one?